Engcon, the world’s leading tiltrotator manufacturer, has made its products even smarter, more powerful and easier to service. 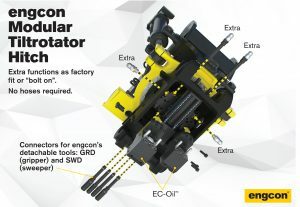 Engcon has upgraded its unique modular design for its automatic EC-Oil hydraulic connection system enabling the quick connection of a GRD detachable grab cassette and SWD detachable sweeper without using hoses inside the hitch. The new hose-free design simplifies the quick hitch because the block is directly attached without the need for hose runs. And it’s just as easy to install and retrofit EC-Oil to Engcon’s new detachable and retrofittable GRD grab cassette and SWD sweeper. In parallel with the development of the new modular tool attachment, Engcon has developed a new high-flow swivel that allows hydraulic flows up to 200 l / min. This is possible to achieve by “directly feeding” the hydraulic function without first passing it through the tiltrotator valves. The new high-flow swivel also has a separate case drain channel, which makes it possible to connect tools with this function via the tiltrotator. The design of the hoseless modular system is a project run jointly with technology consultants, end customers and Engcon’s in-house R&D department. One of the most important requirements Engcon made was for it to be easy to retrofit EC-Oil – Engcon’s automatic oil connection system that allows the excavator operator to remain in the cab while connecting hydraulic tools. 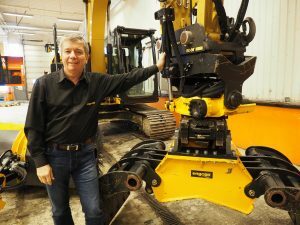 A pre-production series of Engcon’s modular quick hitches will begin rolling out of the Strömsund factory this summer. Delivery of the series will begin with size QSD60 (S60), with QSD70 (S70) planned for the autumn. Further sizes will be launched successively. For more information on Engcon’s new modular quick hitch, see it in operation at this year’s equipment fairs or visit engcon.com. 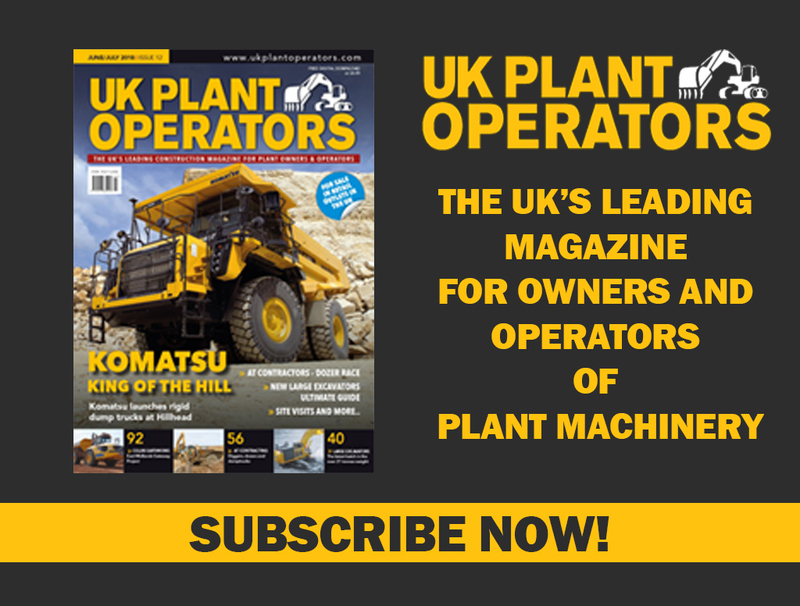 Previous Hillhead 2018 sets new attendance record!